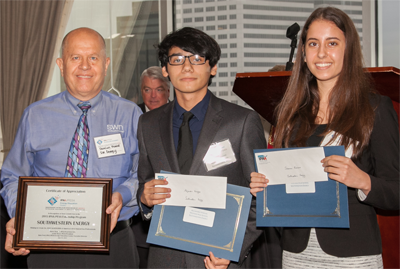 Students Alejandro Venegas and Shannon Rouhana, who completed their externships with Southwestern Energy, pose with Damien Friend, the company’s chief geologist, at the awards banquet. The next generation of America’s oil and natural gas leaders took its first eager steps toward securing successful careers in the energy industry, when a group of 55 rising seniors and recent graduates from the Petroleum Academies at Milby, Westside, and Young Women’s College Preparatory Academy (YWCPA) participated in a two-week, job-shadowing opportunity at various Houston petroleum exploration, production, and service companies. The Independent Petroleum Association of America (IPAA) and the Petroleum Equipment & Services Association (PESA) Student Externship Program began in the summer of 2010 to provide a one-of-a-kind experience for future engineering and geosciences students enrolled in the IPAA/PESA Petroleum Academies, and to date, 394 externs have participated. This entry was posted in District IV - Jolanda Jones, District IX - Wanda Adams, District VIII - Diana Dávila, Volunteers and partnerships and tagged Milby, Westside, YWCPA on July 13, 2015 by HISD Communications. With 38 schools — including 20 high schools — scheduled to either receive new campuses or major renovations, the question of what new schools would look like and what features may get built has been asked countless times. Below is a slideshow of some of the newest Houston ISD high schools, including Carnegie Vanguard, Chavez and Westside. The latter two were built following the 1999 bond program and Carnegie Vanguard was built as a result of the 2007 bond program. The other schools in the slideshow — Lee, Milby and Davis — would receive major renovations in the 2012 bond program. Early voting continues through Nov. 2 and Election Day is Nov. 6. Regardless of when you vote, it’s important to remember that the HISD bond program is the final item on your ballot. Make sure you finish filling out your ballot to have your voice heard on the bond election. See the latest dedication of a building constructed with funds from the 2007 bond program. Sam Houston Math Science & Technology Center recently dedicated a technology and science wing to its building. This entry was posted in 2012 bond and tagged CVHS, Davis, Lee, Westside on October 18, 2012 by HISD Communications.